MyBet Casino is a large and modern online gambling establishment that offers a wide range of games by lots of different providers. The MyBet website is actually made up of four betting areas, as well as the casino and the live casino; there are the sports betting section and the live sports betting section. The MyBet brand is predominantly about sports betting, though the casino is still very much fleshed out, with an impressive number of games to play. Continue reading this MyBet review to discover why the establishment is very much worth signing up to. 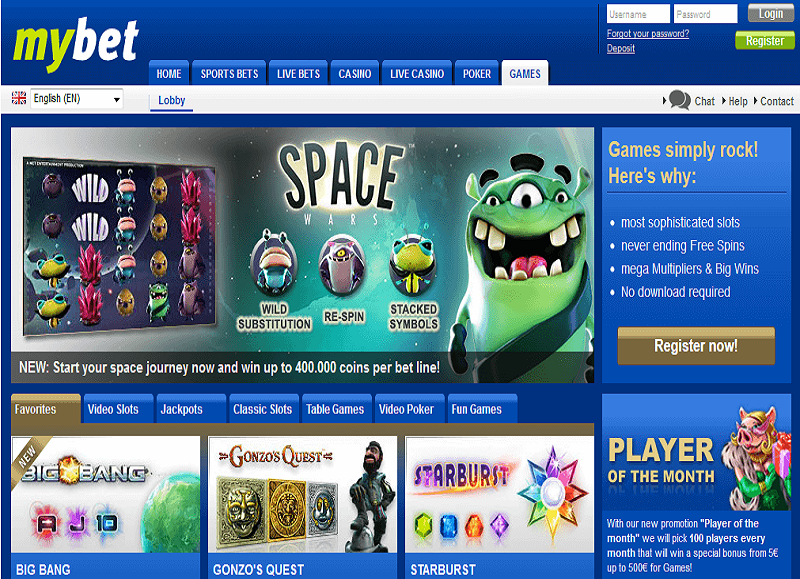 MyBet Casino was launched in 2003. It’s owned and operated by a company called Personal Exchange International and operates on the company’s active gambling licence from the Malta Gaming Authority. Over the years, while continuing to provide players with excellent online gambling experiences, it’s grown its portfolio of games and gambling opportunities quite significantly. While its offerings are certainly impressive with around 750 games listed, its sportsbook offerings are also very good indeed: it offers more than 14,000 sports bets, with a huge selection of betting markets available weekly. In fact, it claims to offer one of the largest varieties of sports betting opportunities online today. There is quite a few MyBet bonus offers available to players. For those who are new to the casino, there’s the welcome offer. When you make your first deposit at the casino, you’ll receive both a match bonus and some free spins. The match bonus is a 500% bonus of up to £50; it has to be wagered 60 times within 10 days in order for you to be able to withdraw your winnings. Slots count 100% towards the wagering requirements, whereas all other games contribute only 20%. As for the free spins, you’ll receive 20 free spins also for your first deposit. They can only be used on the slot Book of Gods and in order to withdraw your winnings, you have to wager your first deposit at least three times. There’s also a sports betting welcome bonus. 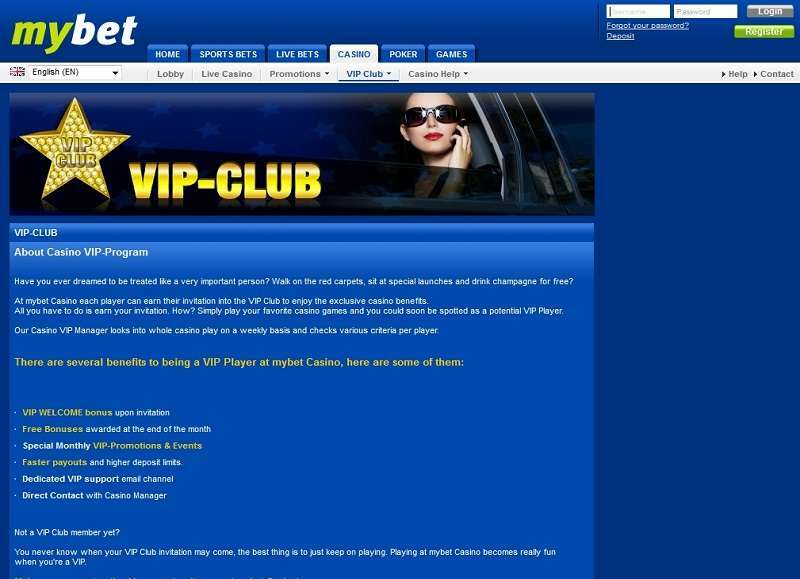 As well as the welcome offers, MyBet Casino has a loyalty scheme and a VIP club. The loyalty scheme is a comp points scheme that all players are enrolled on when they sign up. They earn points by depositing and playing at the casino. Then, once they’ve earned a certain number of points, they can convert them into cash to spend on casino games. As for the VIP club, it invites only, with only the most loyal and dedicated of players qualifying for an invitation. It appears that you can receive an invitation by earning a certain number of loyalty points. Those who do become VIPs get to enjoy an exclusive range of promotions, offers and bonuses, such as enhanced customer support and extra bonus payouts. Select the All Games category, and you’ll see all of the games listed in a large table that’s very responsive. The games can easily be sorted by RTP, minimum bet, maximum bet and provider, with the option to sort them by alphabetical order also available. There are two options for displaying the games: you can have them shown as visual icons (i.e. game logos) or as text (i.e. the name of the game in plain text). Slots make up the vast majority of the games at MyBet Casino, with well over 600 of them listed. Most of them have a fixed jackpot, so there’s an upper limit on how much you can win. A small number of them, however, don’t have a fixed jackpot but instead have a progressive jackpot. Slots such as Divine Fortune, Cosmic Fortune and Super Lucky Frog don’t have an upper limit on their jackpot, which can, therefore, grow very large indeed. Betting values across the collection range from 0.01 to 5,000 coins per spin and the RTP ranges from 85% to a very impressive 99%. Some of the most popular slots include Lightning Box’s Luchadora, NetEnt’s Emoji Planet, NextGen Gaming’s Foxin’ Wins and Pragmatic Play’s Wild Spells. As for table games, there’s quite a large number of them listed at the house. For roulette, there are nearly 20 options available, ranging from Double Ball Roulette and 3D Roulette to French Roulette, Double Zero Roulette and more. As for blackjack, you can choose from games such as 3D Blackjack, Hi-Lo Blackjack and Blackjack Bonus. While roulette and blackjack make up most of the table games category, there are a few other games as well. You’ll find Caribbean Stud Poker, Three Card Brag, Sharp Shooter and Sic Bo, along with several others. Live dealer games are for those who want table games to be more immersive and thrilling. These are real-life games broadcast from specially built studios that players around the world can join in. 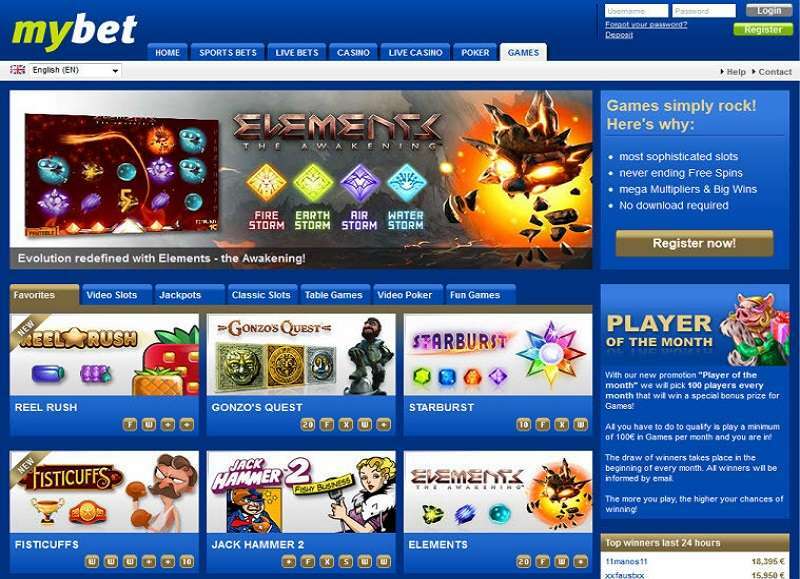 MyBet Casino currently has a total of eight live casino games, all of which are supplied by NetEnt. Four of the games are roulette ones, while the remaining four are blackjack ones. The rest of MyBet games collection is made up of a handful of video poker games and a few dozen virtual sports games. These are virtual versions of sporting events and cover things like horse races, football matches, cricket matches and more. If you’re looking to visit MyBet Casino, you’ll be pleased to learn that it’s easily accessible on a wide range of devices. Those who are on desktop computers and laptops can access the standard desktop casino, which is well-presented with a straightforward, uncomplicated layout and very little in the way of clutter. There’s hardly any theming at all, though the site still looks easy on the eye thanks to its striking black, green and white colour scheme and its modern design. If you want to access the casino on your mobile device, you can do so through your web browser. The mobile casino is fully compatible with iOS and Android devices; it’s designed for use on both smartphones and tablets, with the games easily playable on both types of device. The mobile casino is a top choice for those who like to gamble on the go since it offers plenty of top-quality games optimised for mobile devices and offers smooth navigation and an intuitive user interface. There’s currently no app available to download at the time of writing. Therefore, if you want to access MyBet Casino while out and about, you’ll have to visit the mobile casino. MyBet Casino accepts a good number of different payment methods, ranging from widely used international ones to localised ones only available in certain countries. You can choose from Visa, Mastercard, Maestro, PayPal, Skrill, Neteller and many more, though not every option is available in every country. The minimum amount you can deposit is £10. Deposits are free except if you’re using PaySafeCard, for which there’s a 2% fee. They’re mostly instant, though if you’re using international bank transfer it can take several working days for your real money to appear in your MyBet account. For withdrawals, there are fees if you’re using bank transfer and the withdrawn amount is less than £250, or if you’re withdrawing to a country that doesn’t use the euro. All other withdrawals are completely free. It can take the establishment up to 24 hours to process withdrawal requests. Wait times for individual payment methods aren’t listed, though the site does state that bank transfer withdrawals can take up to four days to reach you. The minimum amount you can withdraw is £30. You’ll be required to withdraw using the payment method you used to deposit money into your account. Some, however, can’t be used for withdrawals, so if this the case you’ll be asked to withdraw your winnings by bank transfer instead. If you need to get in touch with MyBet Casino’s customer service team, you’ll find that there are several options available. First of all, you’re advised to check out the F.A.Q. section, which offers answers to a lot of frequently asked questions. If you can’t find the answer you’re looking for here, you’re then encouraged to get in touch with the customer service team. There are three options available: you can send the team an email, you can contact a team member by phone, or you can use the live chat feature. Customer service is only available between 10 am and 6 pm. There are quite a large number of countries where the casino is fully accessible. As such, it is available in a number of different languages, such as English, French, German, Greek, Turkish and Swedish. Accepted currencies include the US dollar and the euro. With the games coming from nearly 30 different providers, there’s certainly more than enough variety among the games collection. The collection is so diverse in its games line-up that it’s sure to appeal to a wide range of players. Whatever your tastes and preferences are, you’ll almost certainly find plenty of games that you’ll enjoy playing at the casino. If there’s a particular provider whose games you’re eager to play at the casino, you can easily find their productions as you can sort them by the provider. 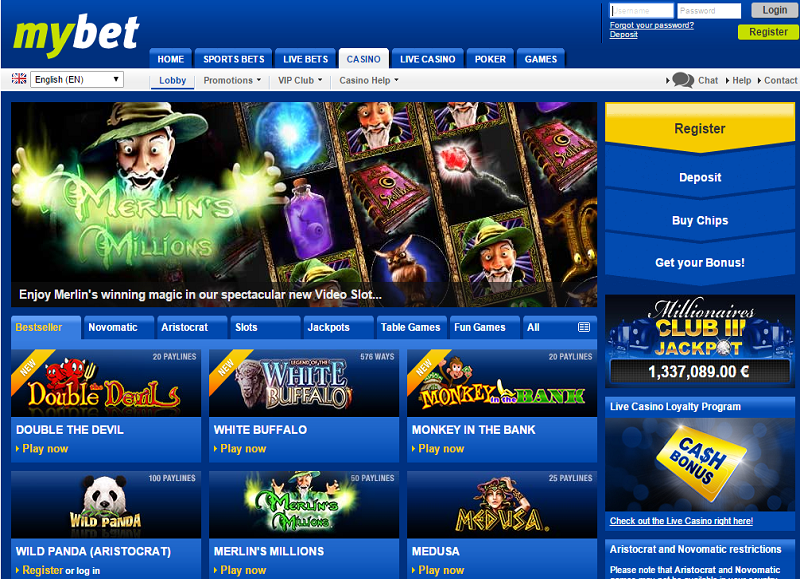 The MyBet online casino is part of the well-established MyBet brand. It’s a well-respected online gambling destination that offers a wide variety of sports betting opportunities in addition to an extensive range of casino games. Here you’ll find hundreds of high-quality games by a wide variety of providers, including some of the biggest and most successful ones in the online gambling industry today. The collection certainly does tick all of the boxes, as it offers more than enough gaming content for players of all tastes. The site is modern, well-designed and easy to navigate. There’s also a very good mobile casino that offers nearly everything the desktop casino and sports betting site has to offer, making it a great site to visit if you’re keen to gamble on the go. There’s quite a good welcome offer waiting for you when you sign up, and once you’re a member, you can start earning loyalty points. You may even become a VIP if you play at the casino enough; if you do, there are plenty of worthwhile bonuses and perks coming your way. Overall, MyBet Casino is not one to be overlooked. It has a lot to offer and even has a fully fledged sportsbook for if you ever fancy betting on something other than casino games. Sign up and start placing your bets today!